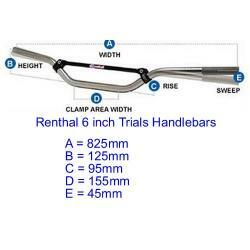 Renthal Trials Handlebars 6 inch. Black with bar pad. Renthals Trials Handlebars 6.0 inch rise, in black finish with a black renthal bar pad pre-fitted. For more information on the dimensions, please click on the image to enlarge. UK - Due to the dimensions of this item it will normally be posted by Royal Mail Standard Parcels (3-5 working days), unless part of a larger order, when a courier would be used. Outside of the UK - Due to the dimensions of this item, it cannot be posted by Royal Mail Airmail. It can be sent via courier, although this may involve additional cost, depending on the size of your order. If you place your order as normal, I will contact you with the options or, if you prefer, please send me an e-mail for further details.